TWO farm shops in Stratford-upon-Avon have won major awards for their products in separate competitions. The Walter Smith Farm Shop at the Wyevale Garden Centre at Black Hill, Stratford, has won a string of awards in the national meat products competition. In the competition — held recently at Stoneleigh Park — the shop won six gold and two silver awards. The gold awards were for free range pork sausage, pork stilton and chive sausage, traditional free range pork pie with turkey and cranberry, free range pork sausage roll, free range pork, stilton and chive sausage roll and free range pork and caramelised onion sausage roll. 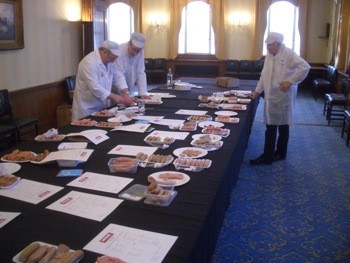 The silver awards were for pork and caramelised onion sausage and pork pie with stilton lid. Meanwhile, Lower Clopton Farm Shop, situated between Upper Quinton and Mickleton, has won Best Farm Shop 2015 in the Cotswold Life Food and Drink Awards. Husband-and-wife owners, Richard and Suzie Baldwyn, were presented with their award by Countryfile presenter Adam Henson at a black tie dinner at Cheltenham Racecourse last week. The Baldwyn family has been farming for three generations and the 211-acre working farm produces traditionally farmed beef, lamb and turkey as well as a variety of crops. They opened the shop in 2004 to supplement their farming income. Mr Baldwyn said: “Our aim has always been to sell the highest quality British produce, sourced either directly from our farm or other local farmers where possible. “The family believes in supporting the British economy and local farming community, so our food has travelled a minimum number of miles and over half of our suppliers are from a ten-mile radius of the shop.